This is our 100th edition. When we launched this newsletter a year ago, I was honestly worried no one would read it. I continue to be surprised and honored that so many of you choose to. My sincere thanks to subscribers old and new. As ever, please tell your friends and colleagues to sign up. Swelling nationalism and religious tensions are coloring two of the world’s largest democratic exercises, in India and Indonesia, thanks in part to incendiary misinformation proliferating on social media. The big picture: Both countries have among the largest populations of social media users on the planet, and cheap smartphones mean more people are being connected every day. The propaganda and fearmongering we’re seeing isn’t new, but powerful tools are spreading it farther and more rapidly than ever before. In both cases, some of the most effective misinformation plays on voters’ suspicions. In Hindu-majority India, that often means portraying candidates or parties as pro-Muslim. In Muslim-majority Indonesia, meanwhile, President Joko Widodo (known as Jokowi) has been depicted as a closet Christian, or even a Chinese infiltrator. In India, political parties including the ruling BJP have “nationwide cyberarmies” that traffic in “targeted misinformation… rooted in domestic divisions and prejudices,” the Atlantic reports. In Indonesia, meanwhile, both leading presidential campaigns have been “funding sophisticated social media operations to spread propaganda and disinformation through fake accounts on behalf of the candidates,” according to a Reuters investigation. The big picture: The number of Indians with smartphones has more than doubled — to over 500 million — since the last national election in 2014. 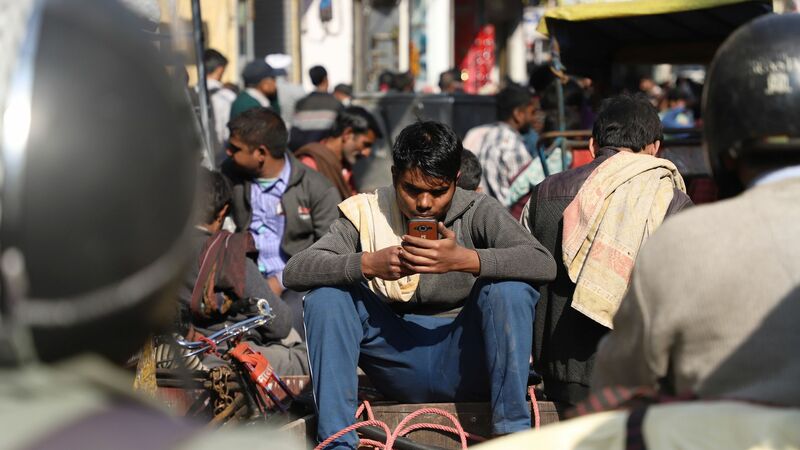 Ravi Agrawal, Foreign Policy's managing editor and the author of “India Connected: How the Smartphone is Transforming the World's Largest Democracy,” tells me that for millions of Indians, a smartphone is not only their first telephone. It’s their first camera, their first computer, their first TV. That has revolutionized the way Indians discuss politics and access news. Savvy users can now fact-check what they hear from candidates or partisan media, Agrawal says — but misinformation spreads quickly in a country with limited media and digital literacy. Facebook has a task force on the ground in India. It also removed 234 Indonesian pages, accounts and groups last Friday "for spreading polarizing political messaging," according to the Atlantic Council’s Digital Forensic Research Lab. WhatsApp, which is owned by Facebook, placed limits last year on how many times a message can be forwarded in India after mob lynchings were linked to viral messages. “Closed circuit messaging networks like WhatsApp and ShareChat make it harder to check and debunk fake news, and that magnifies any potential impact of fearmongering,” Agrawal tells me. What to watch: Experts worry policies nominally intended to weed out fake news could actually lead to restrictions on free speech, Sara writes. The problem of disinformation is growing much faster than our ability to combat it. India's election will be the biggest democratic exercise in history, but depending on turnout, Indonesia's on Wednesday might be the biggest single day election ever. The big picture: Jokowi is Indonesia's first modern president from outside the military or political elite, and massive expectations accompanied him into office in 2014. He has long been expected to secure re-election (most polls have showed him leading by double-digits), but he played it safe by picking a conservative cleric as his running mate. He's overseen economic growth of around 5% — solid, but not the 7% he promised. Poverty is ticking down, infrastructure is going up, and his personal reputation remains clean. However, Joshua Kurlantzick of the Council on Foreign Relations writes that Jokowi "seems to be ignoring graft by major figures who are willing to support him" and "has used increasingly repressive means to address the growing power of his critics." The contrast with his opponent, Prabowo, remains stark. A former general, he has been accused of ordering abductions and torture, among other abuses (he denies responsibility). More recently, Prabowo has been accused of "[cozying] up to Islamist hardliners for political gain," as the Guardian puts it. He's also seen as erratic, and a potential threat to Indonesia's democracy. What to watch: This is a rematch. Jokowi beat Prabowo by 6% in 2014, but the former general declared that the election had been stolen. He's already made similar noises this time around, and Jokowi is hoping for a landslide that would muffle such claims. Few things are more horrifying than watching history burn. Construction began on Paris' Notre Dame cathedral in 1163 and was completed nearly two centuries later. Today, a fire possibly linked to renovation work engulfed the spire and is expected to destroy the entire wooden interior. 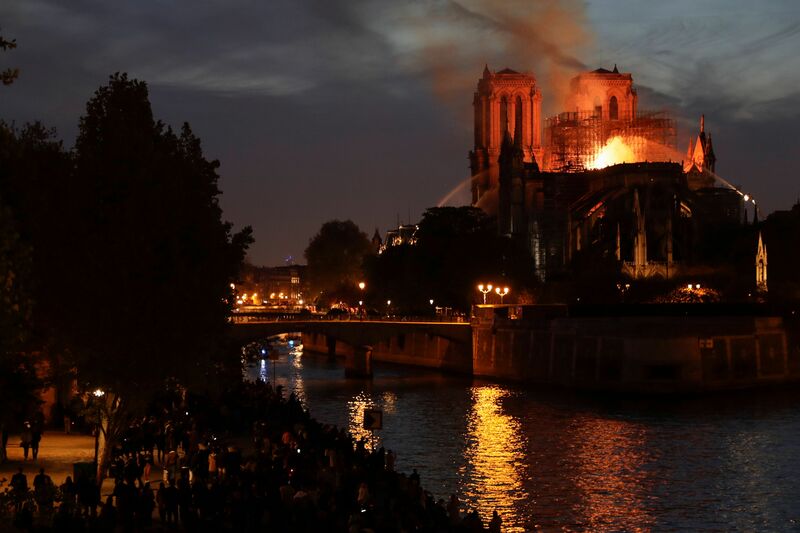 Authorities now say the cathedral's two towers and its main structure have been saved. On the scene: "Tourists and residents alike came to a standstill ... Older Parisians began to cry, lamenting how their national treasure was quickly being lost," per the NY Times. Some began to sing. Watch. 4. "The work of centuries"
In "The Hunchback of Notre Dame," Victor Hugo wrote: "Great edifices, like great mountains, are the work of centuries." "The man, the artist, the individual, is effaced in these great masses, which lack the name of their author; human intelligence is there summed up and totalized. Time is the architect, the nation is the builder." Vox's Constance Grady notes that when Hugo was writing (in 1831, less than two decades before the above photo was taken), the cathedral was in a state of disrepair. It was later rebuilt. Surely, it will be again. "Notre-Dame is aflame. Great emotion for the whole nation. Our thoughts go out to all Catholics and to the French people. Like all of my fellow citizens, I am sad to see this part of us burn tonight," French President Emmanuel Macron tweeted. "Notre Dame is one of the world’s great treasures, and we’re thinking of the people of France in your time of grief. It’s in our nature to mourn when we see history lost — but it’s also in our nature to rebuild for tomorrow, as strong as we can," Barack Obama tweeted. President Trump called the fire "one of the great catastrophes" and expressed his condolences to the people of France. He later suggested: "Perhaps flying water tankers could be used to put it out. Must act quickly!" A new International Crisis Group report explores how the U.S. got involved in the Saudi-led campaign in Yemen, where things went wrong, and what lessons have emerged for U.S. foreign policy. The big picture: The authors write that "Washington initially overestimated its ability to shape coalition conduct and underestimated the devastation of the conflict it was helping enable." They also note that both Barack Obama and Donald Trump elected "to continue this assistance even after the miscalculations had been exposed." Why the U.S. got in: The authors spoke with senior Obama administration officials who said they had viewed Yemen's president as a good partner, particularly on counterterrorism, and his ouster "as an affront to the international order." The officials "sympathized" with Saudi Arabia's security concerns over the Houthi insurgency, and "knew that Iran was offering the Houthis some support — though, unlike Riyadh, they did not see this as a threat to the kingdom of strategic proportions." The Obama administration was also "highly conscious of growing strains in the relationships" with Gulf partners that had been "exacerbated" by the Iran nuclear deal. Where things went wrong: The Obama administration recognized the war as a quagmire "within months," during which time "evidence of the coalition’s brutal tactics had already emerged." Many officials believed the U.S. could shape the coalitions behavior, though they "never had a realistic plan for achieving this objective, nor for what to do when efforts to achieve it failed." The Trump administration then "drew ever closer to Riyadh" and "efforts to press the coalition to temper its tactics and ultimately exit Yemen’s civil war faded further into the background." What to watch: One lesson for Washington, the authors write, is that leverage over security partners like Saudi Arabia "sometimes can only be effective by taking the hazardous step of putting the partnership on the line." In Sudan, protesters remain camped outside army headquarters in the capital, Khartoum, four days after a coup toppled strongman Omar al-Bashir. The bottom line: Protesters in both countries have managed to force out their presidents without firing a shot. But they want to transform the entire system, not just swap out the person at the top of it. Expert Voices: Pompeo's Paraguay visit highlights regional stakes for U.S.
— Secretary of State Mike Pompeo to Washington Post reporter John Hudson. Hudson had asked Peru's foreign minister about the prospect of western sanctions deepening Venezuela's humanitarian crisis.